Home/Will We Kiss Our Ash Goodbye? An ecological catastrophe is unfolding across the upper Midwest and is spreading outward, as scientists struggle to find solutions to the latest insect invasion: emerald ash borer. 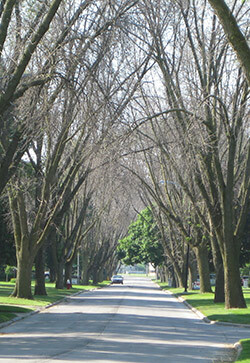 Toledo, Ohio trees after emerald ash borer in August 2009. Credit: D. Herms. It’s not like we haven’t seen this sort of thing before. In the early 1900s, people who lived in the eastern U.S. watched chestnut blight, an exotic pathogen, roll through, killing large and small trees and altering the hardwood forest forever. A few decades later, Dutch elm disease, an exotic pathogen carried by an exotic bark beetle, came through, killing majestic American elms along city streets and in forests. Today, more than 450 species of nonnative forest insects and at least 17 significant forest pathogens are established in the U.S. Most go unnoticed, but about 15 percent have had major consequences. And it’s starting again. Emerald ash borer, an Asian insect first identified in Detroit, Mich., in 2002, has become the most destructive forest insect to ever invade the U.S. Tens of millions of ash trees have already been killed in forests and swamps, along waterways and in urban, suburban and rural neighborhoods. Populations of emerald ash borer, commonly known as EAB, have been found in 18 states, along with Ontario and Quebec. And almost assuredly, there are more populations, simmering away, that haven’t yet been discovered. An adult emerald ash borer feeding on a leaf. Credit: David Cappaert. 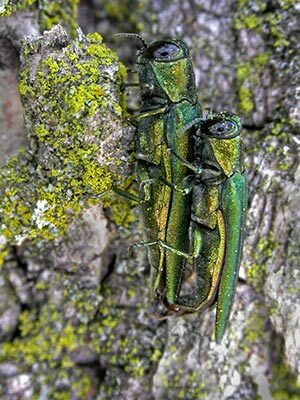 Adult EAB beetles are beautiful insects and amazingly good at finding and colonizing ash trees. Unlike many insects, EAB does not appear to produce any long-range pheromones to attract potential mates. Instead, the beetles use their vision and the mix of chemicals emitted by ash leaves, bark and wood to find their host trees and each other. They are particularly attracted to the blend of compounds given off by stressed or injured ash trees and to specific shades of purple and green. Once beetles find an ash tree, they nibble along the margins of leaves throughout their three- to six-week life span. Leaf feeding is important for the beetles to mature, but it has virtually no effect on the trees. After 15 to 20 days of leaf feeding, the females begin to lay a few eggs at a time, tucking them beneath bark flaps or in bark crevices. Many beetles mean many eggs — bad news for the tree when they hatch. 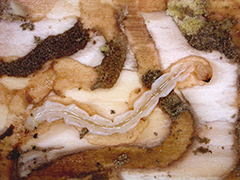 The tiny, cream-colored EAB larvae hatch from their eggs in mid-summer and chew through the rough outer bark to reach a layer of inner bark, called phloem. Phloem is the tissue used by trees to transport carbohydrates and other nutrients from the canopy down to the roots. The larvae feed in s-shaped tunnels, called galleries, for several weeks in summer and early fall. As the larvae grow, the galleries increase in size. Galleries often etch the outer ring of sapwood, which ash trees use to transport water up from the roots to the canopy. A few larvae feeding in a large branch or on the trunk of an ash tree have little effect on the tree. Over time, however, as the density of larvae builds, the ability of the tree to transport nutrients and water is disrupted by the galleries. The canopy begins to thin, and large branches may die. Eventually, the entire tree succumbs. Once EAB populations begin to build, nearly all ash trees in the forest, swamp or urban area are likely to become infested and die — often within a time span of only a few years. In southeast Michigan, where EAB was first established, scientists have documented 99 percent mortality in forest stands dominated by green ash (Fraxinus pennsylvanica), white ash (Fraxinus americana) or black ash (Fraxinus nigra). More than 60 million ash trees, ranging from one inch to five feet in diameter, have been killed by EAB in this area alone. We know most adult EAB stay within about a half mile of where they emerge. In any population, however, at least a small proportion of beetles seem to fly farther — for reasons that are as yet unknown. Adult EAB are relatively good fliers; they’re much more agile and streamlined than bark beetles, for example. Mature females are probably capable of flying three miles. Unfortunately, EAB has been moved across longer distances by people who unknowingly transported infested ash trees from nurseries or recently cut logs or firewood. Once an ash tree dies or is cut, the phloem dries out, and it will not be re-infested, but any larvae already under the bark can complete their development and emerge as adults. Federal and state quarantines have been imposed to regulate the transport of ash trees, logs, wood and related materials to reduce the risk of additional EAB introductions. In fact, accidental transportation of infested ash is probably how EAB got to North America in the first place. The introduction of EAB into the U.S. and Canada almost certainly occurred when infested wood crating or pallets originating in China arrived in the U.S. In its native range in China, EAB functions as a secondary pest, colonizing only severely stressed or dying Asian ash trees. In North America, however, native ash trees have no co-evolutionary history with EAB and have few defenses to resist this pest. 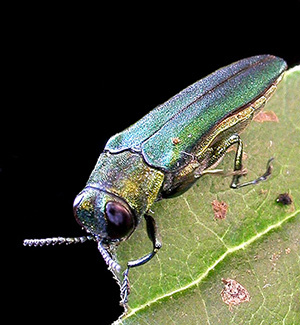 While EAB beetles still prefer to colonize stressed ash trees, they will also readily infest — and eventually kill — healthy ash trees. Larvae feeding on the trunck of an ash tree. Credit: David Cappaert. The potential economic and ecological impacts of EAB are staggering. National inventory data show more than eight billion ash trees in U.S. forests and woodlands, with a value estimated at more than $280 billion. Ash trees are especially abundant in eastern forests, but the mother lode of diversity is actually in the southwestern U.S., where at least eight of 16 native ash species occur. Cultivars of green ash, white ash and velvet ash (F. velutina) have also been planted in landscapes and along roadways across the U.S. for decades. Because ash was so commonly propagated, nurseries sustained millions of dollars in losses when the EAB quarantines were imposed. Hundreds of millions of mature urban ash trees are growing on municipal and private land in the U.S. A 2010 analysis in Ecological Economics examined the potential costs of either treating or removing 50 percent of landscape ash trees in urban areas affected by EAB. Projected costs would exceed $10.5 billion by 2019. If suburban ash trees are included, costs nearly double. 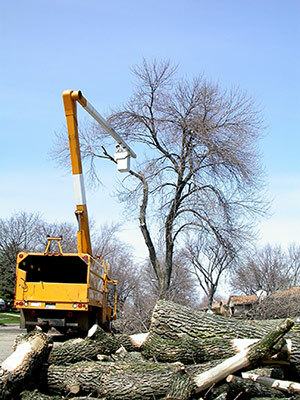 Estimating costs of treatment or removal, however, does not do justice to the full economic impacts of losing ash trees, especially large trees, in residential and developed areas. 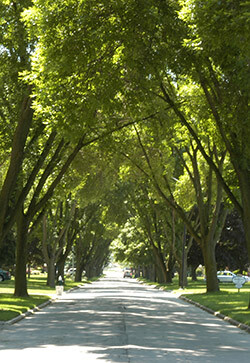 Ash trees comprise up to 50 percent of the municipal trees growing along boulevards and in parks in some cities. Once ash trees die, they begin to decay relatively quickly, posing hazards to homes, vehicles and people. Losing a substantial portion of mature trees dramatically alters the appearance of neighborhoods and diminishes property values. Stormwater run-off increases. Shade decreases, and air conditioners run longer. In southeast Michigan municipalities, water use soared as a result of widespread ash mortality, resulting in surcharges levied by the regional water authority. Ash trees cut down dur to EAB. Credit: Deborah G. McCullough. Economic projections, of course, do not address the ecological consequences likely to occur following extensive mortality of ash trees in forests, particularly in areas where ash is a major component of the overstory. Green ash, the most widely distributed ash in the U.S., grows in many types of soils and is often abundant along rivers, streams and other waterways, as well as in forests. White ash is also widely distributed, frequently growing in mixed stands with oaks, maples and other hardwoods. Black ash occurs most commonly in swamps and bogs in the northern U.S. and parts of Canada, often in sites where it is the only tree present. Unfortunately, black ash is also a highly preferred host for EAB and very vulnerable — it generally takes fewer EAB larvae to kill black ash trees than similarly sized trees of other ash species. The long-term ramifications of ash mortality in forests and riparian settings are not yet known, but can be expected to cascade through ecosystems. Nutrient cycling, hydrology, composition of herbaceous plants and the habitat available for birds, mammals, insects and other animals are all likely to be affected. Along with its ecological value, black ash has cultural and spiritual significance for many American Indian tribes from Minnesota to Maine, as well as First Nation tribes in Canada. Some tribes even trace their origin to a black ash tree that split — one fork became man and the other became woman. The art of black ash basketry has been handed down from generation to generation in many tribes. Basket-making families have traditional harvest grounds, where they carefully select and harvest a few black ash trees each year. Most native basket makers are well aware of EAB and what this invader means for black ash across North America. Cooperative efforts to collect and preserve ash seeds, including seeds from black ash trees, have been undertaken by a number of tribes, along with scientists from federal agencies and universities. Girdling black ash trees. Credit: John Bedford. Whether anything can be done to protect North American ash from EAB depends on whether your glass is half-full or half-empty. Detecting new EAB infestations and trees with low densities of larvae remains a major challenge. Newly infested trees exhibit few, if any, external symptoms, making visual surveys unreliable. The most effective detection method involves girdling an ash tree in spring. Girdling — removing a band of bark and phloem around the circumference of the trunk — induces stress that attracts adult EAB, including egg-laying females, during the summer. The girdled tree must then be debarked — or burned or chipped — in fall or winter. If larval galleries are found, then the tree or the site is certainly infested. 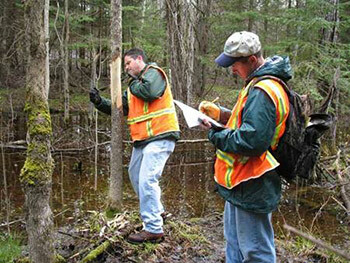 Despite the effectiveness of girdled trees, this is a labor-intensive survey method and often impractical. Purple or green artificial traps, baited with lures comprised of chemicals produced by ash trees, are also used for EAB surveys in many states. The baited traps, however, are not highly effective — in part because the lures and traps must compete with the live ash trees in the area. Most “outlier” infestations of EAB were not discovered until they were at least four to six years old. Despite these challenges, much has been learned in the 10 years since EAB was discovered, and progress has been substantial. New systemic insecticides and application technology are available, enabling homeowners and municipalities to effectively and consistently protect valuable landscape trees. Systemic insecticides are typically applied either by injecting the product directly into the base of the trunk or by drenching the soil around the base of a tree. These products have relatively low toxicity to humans and few impacts on non-target organisms. 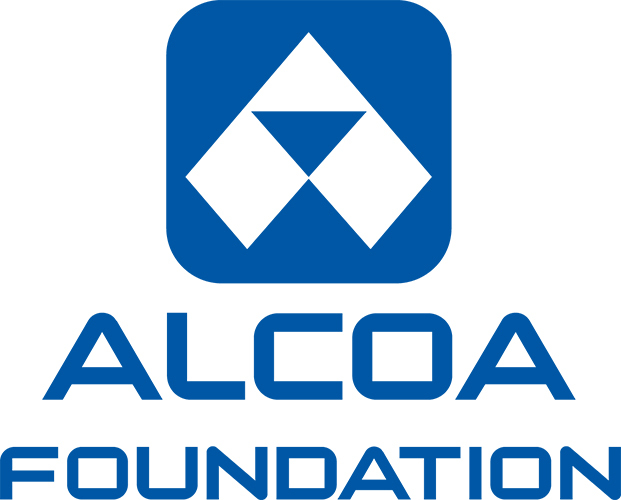 One recently approved product provides two to three years of highly effective protection, reducing costs and logistical issues for homeowners and municipal arborists. Federal agencies are hopeful that biological control may eventually play a role in EAB management, as well. Millions of dollars have been spent on a major effort to identify, evaluate, rear and release parasitoid wasps that attack EAB in China. Parasitoids are tiny, highly specialized wasps that lay eggs on immature stages of a host insect. After hatching, the immature wasp feeds on the host insect, eventually killing it as it completes its own development. Scientists from the U.S. and China worked together to identify parasitoids that appeared to be important natural enemies of EAB in China. Selected parasitoid species were then screened in quarantine facilities to determine their “host range” and assess whether they might pose any ecological risk in North America. Two species of parasitoids that attack EAB larvae and one tiny wasp that attacks EAB eggs are now being reared in large numbers in a U.S. Department of Agriculture facility and released in states with EAB infestations. Whether these Asian imports will be able to actually control EAB populations and prevent damage to ash trees may take years to determine. 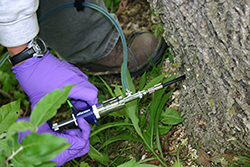 Injecting an ash tree with insecticide to protect it from EAB. Credit: Deborah G. McCullough. In the meantime, scientists are learning more about native, natural enemies of EAB. In the past, native parasitoid wasps in the U.S. have evolved to find and attack the larvae of native beetles, such as bronze birch borer, that colonize stressed or dying trees. Until recently, however, native parasitoids rarely, if ever, attacked EAB larvae. At least one native parasitoid, Atanycolus cappaerti, now seems to be “learning” about EAB. This tiny wasp had never been studied and did not even have a scientific name until 2010. In the last five years, Atanycolus cappaerti has become increasingly common, usually in sites characterized by heavily infested, dying ash trees. Relatively little is yet known about this wasp and whether it will be able to slow the population growth of EAB. A bright spot in the EAB saga involves blue ash (F. quadrangulata), a North American species which ranges from southern Michigan to Kentucky, Tennessee and Missouri. Scientists recently determined that blue ash is relatively resistant to EAB, making it likely that this species will survive the EAB invasion. Understanding more about the chemical and physical traits that underlie blue ash resistance may eventually lead to selective propagation of resistant ash cultivars. Many areas — from individual neighborhoods to large cities — are beginning to implement an integrated approach for EAB management. Healthy landscape ash trees, for example, can be treated with a systemic insecticide, while urban ash in poor condition can be removed, reducing the amount of ash phloem available for EAB reproduction. Another management option involves using girdled trees as “trap trees.” Once girdled trees have been debarked in fall or winter, the EAB larvae in the trees will be killed before they can complete development. A pilot project called SLAM (SLow Ash Mortality) was launched in two EAB sites in upper Michigan in 2009 to evaluate different management options. Results to date show the combination of insecticide injections, selective ash removal and trap trees is slowing the growth of the EAB population in the two areas. On the other hand, there is still plenty of cause for concern. While practical for urban and suburban trees, insecticides are not a solution for the millions of ash trees in forested or riparian settings. While many scientists are optimistic about the potential success of the Asian wasps imported for biological control, others point out that there are few examples of parasitoids controlling any phloem-feeding insect. Moreover, federal funding for activities such as EAB detection, research and outreach is expected to be cut by 75 percent in the next year. It seems inevitable that we will most likely kiss millions more ash trees goodbye before we find a good solution to EAB. Adult emerald ash borers mating. Credit: David Cappaert. Dr. Deborah G. McCullough is member of the American Forests Science Advisory Board, a professor of forest entomology at Michigan State University and a member of a multi-disciplinary working group assigned to identify nonindigenous forest insects and pathogens established in the U.S. Learn what you can do in the fight against EAB.